Mitigation of signal leakage within the subscriber premise is essential for the successful operation of the subscriber’s cable and cellular services. To thoroughly evaluate the potential for interference to subscriber services, Trilithic has developed a patent pending approach to signal leakage measurement which will comprehensively test the Aeronautical and LTE bands in both fully digital and analog cable systems. Historically, signal leakage detectors have required high levels of sensitivity to measure signal leakage radiating from the CATV system. Measurement within the subscriber premise and the migration to all digital services places even greater sensitivity requirements upon the leakage detector combined with a new requirement to simultaneously monitor for signal leakage in both the aeronautical and LTE bands. In laboratory experiments signal leakage measurements as low as 0.1 uV/m have proven sufficient to allow LTE signals to enter the subscriber network and disrupt cable services. Achieving a measurement sensitivity of 0.1 uV/m is beyond the measurement range of conventional signal leakage detectors and requires a new approach to leakage detection within the subscriber premise. To meet the new measurement and sensitivity requirements, the Seeker Home monitors 138 MHz and 757.5 MHz simultaneously, supporting testing in both the Aeronautical and LTE frequency bands. The Seeker Home Signal Source replaces the Cable service with two high output test carriers which pressurize the subscriber cabling revealing any damage which may lead to service interruption from ingressing LTE carriers. The Seeker Home Signal Source has two output levels. A +60 dBmV for home certification and a +40 dBmV output level should the subscriber network prove too porous for pinpointing the location of a leak at the higher transmit level. The displayed leakage levels are normalized by the Seeker Home receiver to reflect the value of the leak at nominal systems levels within the subscriber premise. The normalization of the measured and displayed leakage levels simplifies the evaluation of leakage severity and provides consistency for documentation of leakage levels in accordance with established industry practices. When utilizing the higher +60 dBmV transmit level the Seeker Home is able to locate signal leakage down to a normalized leakage level of .1 uV/m with a single flexible antenna; making it possible to locate and repair signal leakage levels far beyond the measurement range of conventional leakage detectors. Until recently finding and fixing leakage in the aeronautical band was considered “good enough” for almost all cable operators. But, with increased deployment of off air services by cellular providers and increased bandwidth demands of both the MSOs and cellular providers, keeping the cable plant tight has never been more important. Additionally, the increase in service demands for cellular bandwidth has pushed services into the 700-800 MHz (LTE) band and maybe even lower into the 600 MHz band in the near future. Up until now leakage detection has focused on the outside plant, but as cellular devices become more prevalent we need to somehow verify if these devices are causing harmful interference when they are in close proximity to leakage or ingress sources within a home. Since the relative distance between a cell tower and cellular devices determines the transmit level of cellular devices, this can results in cellular devices transmitting their data with a signal strength as high as 3 V/m. Due to this possibility of high transmit level of cellular devices, even the smallest sources of leakage or ingress points within the home can lead to cellular signals causing issues with downstream QAM channels. With this problem in mind, Trilithic has developed the Seeker HL In-Home Leakage Evaluation System as a solution for finding the smallest of leaks in the home and to help identify any shielding defects that will allow cellular signals to enter into the cable system. 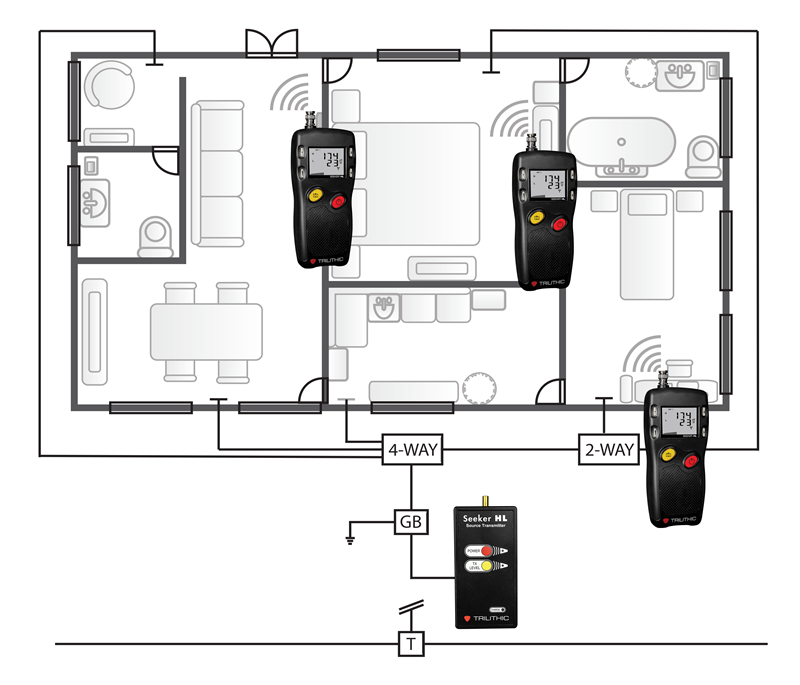 During an installation or service call, the Seeker HL In-Home Leakage Evaluation System provides technicians with a way to comprehensively evaluate the customer premises for leakage in both the Aeronautical and LTE bands within fully digital, analog and mixed cable systems and is the only system available to quickly, easily and accurately verify that the shielding integrity of in home wiring meets the needs of today’s high tech world. This innovative, patent-pending method of in home leakage detection involves using the Seeker HL Source Transmitter to replace the cable service at the subscriber’s ground block. The higher levels of the Seeker HL Source Transmitter will increase the field strength of the signals radiating out of the customer’s home network, providing a higher level of sensitivity to find even the smallest of leaks. The transmitter injects two single CW carriers into the subscriber network with a 20 Hz tag modulation, one inserted at 138 MHz and another at 757.5 MHz supporting testing in both the Aeronautical and LTE bands. The source transmitter signal level is at considerably higher level than typical active plant levels in order to “over-pressurize” the cable system in the home. This approach is similar to pressurizing a water pipe and looking for any sources of water that may point to the location of a defect in the pipe. Using the Seeker HL with its source transmitter allows the technician to detect leakage levels at an otherwise unheard of sensitivity down to 0.1 uV/m. The user may set the output level to 60 dBmV for home certification, but also has the option to reduce the level to 40 dBmV should the subscriber network prove to be too porous for pinpointing the location of a leak at the higher transmit level. The Seeker HL provides both a visual readout of the measured levels in uV/m and a tone proportional to signal strength. To prevent false triggering the Seeker HL utilizes Trilithic’s unique channel tagging technique. When checking the integrity of in-home shielding and to provide consistency with leakage levels typically found within the subscriber premise, the levels displayed by the Seeker HL have been normalized to represent the value of a leak at typical system levels. This correlation between measured and displayed levels will assist the technician in evaluating the severity and recording of a leak based upon established industry practices.